Today, Mangsir 12, is the 36th remembrance day of Swor Samrat Narayan Gopal. Although he has died a long time ago, his songs are still as popular as before. The musician, Bulu Mukurung, is one of the musicians who had also spent a long time with the singer. He has recollected some of his experiences with the singer. Bulu Mukarung met Narayan Gopal for the first time in 2036 BS. Mukurung was in Royal Academy at that time in music training. There was a program of Narayan Gopal in the Academy. He went to the stage and started singing. While Narayan Gopal was singing, one of the persons in the audience started making noise. When the guy didn’t stop making noise, Narayan Gopal stopped singing and cried "Who is that guy. Come here." Narayan Gopal went out of the stage. At that time Mukurang met the singer for the first time - at the backstage. The situation wasn’t good at that time. After a clash few glasses of the Academy building were also broken during the incident. After 2037 BS, Mukurung and Narayan Gopal started meeting frequently. A play of Madhav Ghimire titled 'Shakuntala' was being staged in Academy. Musician Chandra Raj Sharma had agreed to compose the music for the play and Narayan Gopal had agreed to sing the song. I used to be in the Academy when Narayan Gopal came to practice singing. Narayan Gopal didn’t use to practice singing right away. He used to complain about arrangement or other stuffs. So, he only used to practice on the days he liked. Before practice, he used to say, "Let’s go Bulu." We used to go to a nearby restaurant, we used to drink for a while. I used to drink Limca (a soft drink) and Narayan Dai used to drink Vodka. After drinking he used to say that he was now ready. He used to open up after drinking. He was reserved before drinking. 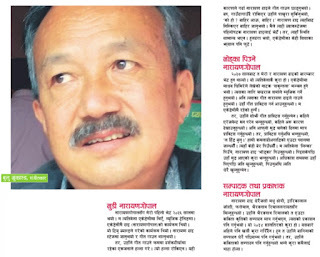 Narayan Dai was close with Madhu Chhetri, Dwarika Lal Joshi, Phatteman, Bhairav Nath Rimal etc. He not only edited one of the poem collection of Bhairav Nath Rimal, he had also published the book. That was around 2034 BS. Although he was the editor of 'Bagina' for a long time. But, very few people know that Narayan Gopal also used to edit poems. In 2038 BS, Narayan Dai was the GM (General Manager) of Rastirya Naachghar. He was carefree even at that time. I can call hims 'Bindaas Narayan Gopal'. One day I went to meet him with my friend Radha Krishna Lamichhane. When we reached his office, he was reading a newspaper in a carefree manner. He had taken off his shoes and had his feet on the table. He didn’t notice when we entered the room. We were there to ask him the stage for a program. He didn’t notice us for a while in the room. He didn’t cared when we coughed to tell him about our presence there. We couldn’t gather courage to call him. After a long time, he took off his magazine and saw us. "Oh it’s you guys?" We told about the stage. He asked for a guy for the availability of the stage on the date we need. He told the stage is not available on that date and we returned.